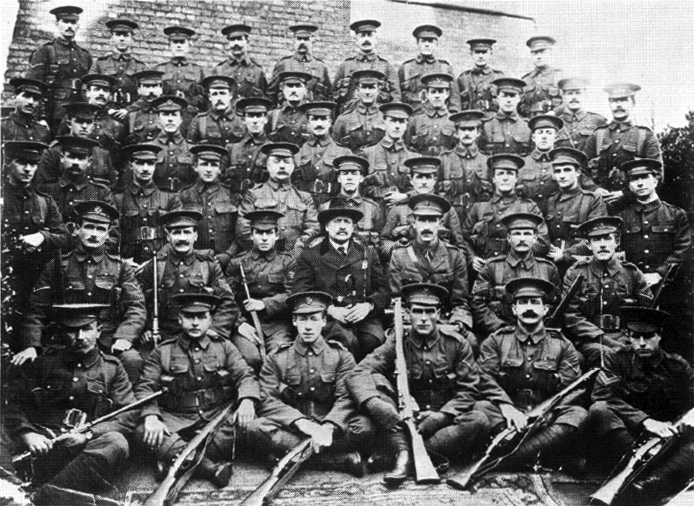 Men of the original Rhodesian Platoon of the King’s Royal Rifle Corps (during the course of World War I, there were several such platoons). Taken in November 1914 at the KRRC training depot at Sheerness, Kent, before the platoon went to the Western Front. In the centre of the second row from the front sit the 16th Marquess of Winchester and the platoon’s commanding officer, Captain John Banks Brady. The majority of the men pictured were killed in action, with most of the others severely wounded. I have not been able to find out more about either 2nd Lt G Simpson of the Army Services Corp (ASC) or Capt William Petre (Billy). All I do know is that Billy, on front line duties, enclosed the letter from Geoff Simpson when he wrote to Chrissie Wise in Rhodesia. The letter talks of the contribution made by Rhodesians and it tries to convey courage and cheer. ‘Brady’, mentioned in the letter, is in the photograph above. At the end of the letter I have added a bit about Captain John Banks Brady and his distinguished service in both world wars. The information has come from the auction notes at the sale of his medals in 2004 which raised £3,400. I have been most neglectful in not sending you a line for all these many months and I have had my deserts in missing you in May. I had rather a strenuous winter camp building in Surrey and after sundry tries to pass the medical I stormed the War Office with Brady and Colonel Burns Bigg, spent two days there and two days later received a commission in the A.S.C. A thoughtless Govt sent me to this wretched town for Depot work. There is not a great deal to be done in spite of our feeding the Northern Command and it is difficult often to fill in the day with private correspondence. There are a very decent lot of fellows here and we are quite a happy party. Leeds is a filthy town & of course we are not in the best part. Brady and the Rhodesians have been in the trenches since December. He is a Capt. in the K.R.R. So far he has dodged German bullets but his old friend malaria laid him low. He was staying with Sir C Metcalf at Godalming & came over to see us. We had several days in town together where we met Hugh Fraser & Bertie. I also saw W. W. Tucker who has come home. Brady is somewhere near Ypres so peradventure you might come across him. The Rhodesians have done very well and several have been given commissions for services. Fraser has a Captaincy in the Rifle Brigade. Wyndham is in GSW Africa. Yesterday I called on Mrs Dougal Malcolm the Director’s wife. She is staying with Lady Dorothy Wood who has a beautiful place here. Did you meet her in Rhodesia. I rather fancy their time at Charter House came after you left. Bertie has improved immensely. He was stationed not far from Godalming and came over several times. Have not heard from the Wises at all although I sent Mrs W some snaps of Launcelot and Harry which I took at Reigate. My mother is in Cape Town and very much better I am thankful to say. Col and Mrs Edwards lost their only son at Ypres. I feel there is not much chance of my seeing any of the fun abroad as I hear one gets rather stuck in this part of the A.S.C. You must try & dodge the shells old chap. I have often thought of you and wondered where you were & what you were doing in spite of my seeming neglect. The day after JB left the trenches one of his subs was killed in his (JB’s) dug out where JB had been lying ill with malaria the previous day. A shell dropped right in. It certainly looks as if the war will last a long time but you must keep your pekker up. We are not going to win if we are half hearted. The uneducated classes at home do not yet realise the gravity of the situation. Whatever our job we must do it cheerfully and if dull must try and feel that at any rate we represent a necessary nut and bolt in the great and complex machine & that on our individual energies depends the smooth and successful working of the whole. I do hope your brother will come through alright. These armies seem to have nerves of the finest steel & courage & daring beyond description. In the photograph at the top of this article ‘Brady’, then a captain, had been given command of No.16 Platoon, ‘D’ Company of the 3rd Battalion. This platoon became known as the Rhodesian platoon and landed in France the December after the photograph was taken. The photograph caption says most of the men were either killed or severely wounded which might be why Brady then transferred to the 2nd Battalion and went on to Loos where he was gassed. He returned to the Front in 1917 and won a Distinguished Service Order (DSO), the French Croix de Guerre and was mentioned in despatches for the third time. In March 1918 he was wounded at Le Sars and evacuated back to the UK. By July he had returned to front line duties and was again mentioned in despatches. 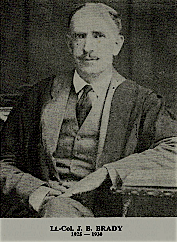 In 1920, with the rank of Lt Colonel, Brady retired and returned to Southern Rhodesia and his earlier career in education. He became Senior Inspector of Schools and then headmaster of Milton College in Bulawayo. Brady returned to uniform and served as a Military Observer and Southern Rhodesia Liaison Officer for Middle East Command until he became too ill to continue. He was awarded an OBE for his services. He died at the age of 77. The photograph of the platoon is originally from the National Archives of Zimbabwe and then scanned from McLaughlin, Peter (1980). Ragtime Soldiers: The Rhodesian experience in the First World War. This entry was posted in First World War, The UK, Zimbabwe and tagged Bulawayo, Capt Billy Petre, Captain J B Brady, Chrissie Wise, Geoff Simpson, Milton College, Rhodesians, the First World War, the Front. Bookmark the permalink.